It has made considerable achievements in academic circles both at home and abroad on the re-search of inter-firm opportunism in the circumstances of cooperative relationship. Inter-firm op-portunism is the behavior of a trading party in a cooperative relationship, which violates the re-quirements of contracts or relational contracts, makes the opportunist party gain interest and en-croach on the interests of the other party, and then brings many adverse effects to cooperation. In addition to the incomplete contract, the antecedents of inter-firm opportunism include many fac-tors such as environment, cooperation task, power, principal-agent, inter-organization structure. The governance strategies of inter-firm opportunism include the binary relationship governance and the network relationship governance. The academic field studies the binary relationship gov-ernance from the perspective of independent effect, combination effect and contingency perspective of formal governance and relationship governance. Furthermore, we prospect the further research. Williamson, O.E. (1975) Markets and Hierarchies: Analysis and Antitrust Implications. The Free Press, New York. Masten, S.E. (1988) Equity, Opportunism, and the Design of Contractual Relations. Journal of Institutional and Theoretical Economics, 144, 180-195. Williamson, O.E. (1991) Economic Institutions: Spontaneous and In-tentional Governance. Journal of Law, Economics, and Organization, 1, 159-187. Macneil, I.R. (1981) Economic Analysis of Contractual Relations: Its Shortfalls and the Need for a Rich Classificatory Apparatus. Northwestern Uni-versity Law Review, 75, 1018-1163. Luo, Y.D. (2006) Opportunism in Inter-Firm Exchanges in Emerging Markets. Management and Organization, 2, 121-147. Wathne, K.H. and Heide, J.B. (2000) Opportunism in Interfirm Relationships: Forms, Outcomes, and Solutions. Journal of Marketing, 10, 36-51. 任星耀, 朱建宇, 钱丽萍, 王鹏. 渠道中不同机会主义的管理: 合同的双维度与关系规范的作用研究[J]. 科学学研究, 2012, 15(3): 12-21. Ghoshal, S. and Moran, P. (1996) Bad for Practice: A Critique of the Transaction Cost Theory. Academy of Management Review, 21, 13-47. Jap, S.D., Robertson, D.C., Rindfleisch, A. and Hamilton, R. (2013) Low-Stakes Opportunism. Journal of Marketing Research, 4, 216-227. Williamson, O.E. (1985) The Economic Institutions of Capitalism: Firms, Markets, and Relational Contracting. Free Press, New York. 王节祥, 盛亚, 蔡宁. 合作创新中资产专用性与机会主义行为的关系[J]. 科学学研究, 2015(8): 1251-1260. 叶飞, 张婕, 吕晖. 供应商机会主义行为对信息共享与运营绩效的影响[J]. 管理科学, 2012, 25(2): 51-60. Wang, X.H. and Yang, Z.L. (2013) Inter-Firm Opportunism: A Meta-Analytic Review and Assessment of Its Antecedents and Effect on Performance. 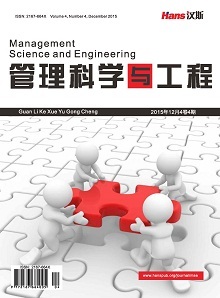 Journal of Business & Industrial Marketing, 28, 137-146. Ghosh, M. and George, J. (1999) Governance Value Analysis and Marketing Strategy. Journal of Marketing, 63, 131-145. 徐二明, 徐凯. 资源互补对机会主义和战略联盟绩效的影响研究[J]. 管理世界, 2011(1): 93-103, 187-188. 刘群慧, 李丽. 关系嵌入性、机会主义行为与合作创新意愿——对广东省中小企业样本的实证研究[J]. 科学学与科学技术管理, 2013(7): 83-94. Jap, S.D. and Anderson, E. (2003) Safeguarding Interorganizational Performance and Continuity under ex Post Opportunism. Management Science, 49, 1684-1701. Chang, J., Bai, X. and Li, J.J. (2015) The Influence of Insti-tutional Forces on International Joint Ventures’ Foreign Parents’ Opportunism and Relationship Extendedness. Journal of International Marketing, 23, 73-93. Barnes, B.R., Leonidou, L.C., Siu, N.Y.M. and Leonidou, C.N. (2010) Opportunism as the Inhibiting Trigger for Developing Long-Term-Oriented Western Rxporter-Hong Kong Importer Relationship. Journal of International Marketing, 18, 35-63. Chung, J.-E. (2012) When and How Does Supplier Opportunism Matter for Small Retailers’ Channel Relationships with the Suppliers? Journal of Small Business Management, 50, 389-407. Seggie, S.H., Griffith, D.A. and Jap, S.D. (2013) Passive and Active Opportunism in Interorganizational Exchange. Journal of Marketing, 11, 73-90. Joshi, A.W. and Stump, R.L. (1999) Opportunism: Integrating and Extending Insights from Transaction Cost Analysis and Relational Exchange Theory. Canadian Journal of Administrative Sciences, 16, 334-352. Scott, W.R. (2001) Institutions and Organizations. Sage Publications, Thousand Oaks. Wang, Z., Huo, B., Tian, Y. and Hua, Z. (2015) Effects of External Uncertainties and Power on Opportunism in Supply Chains: Evidence from China. International Journal of Production Research, 53, 6294-6307. 曾伏娥, 刘红翠, 王长征. 制度距离, 组织认同与企业机会主义行为研究[J]. 管理学报, 2016, 13(2): 203-211. Granovetter, M. (1985) Economic Action and Social Structure: The Problem of Embeddedness. American Journal of Sociology, 91, 481-510. Grant, S.B. (2007) Vulnerability to Post Contractural Opportunism in Supply Chain Co-Operative Exchange. Marketing Management Journal, 17, 169-189. Dong, M.C., Liu, Z., Yu, Y. and Zheng, J.-H. (2015) Opportunism in Distribution Networks: The Role of Network Embeddedness and Dependence. Production and Operations Management, 24, 1657-1670. Sridharan, V.G. and Phang, M.M.S. (2014) Dependent on One But Vulnerable to Another: Opportunism Threats and Control Solutions for Customization Providers. Accountin and Finance, 54, 591-624. Yan, T. and Kull, T.J. (2015) Supplier Opportunism in Buyer-Supplier New Product Development: A China-U.S. Study of Antecedents, Consequences, and Cultur-al/Institutional Contexts. Decision Sciences, 46, 403-445. Villena, V.H., Revilla, E. and Choi, T. (2011) The Dark Side of Buy-er-Supplier Collaboration: A Social Capital Perspective. Journal of Operations Management, 29, 561-576. 周俊, 袁建新. 领域知识专用性投资对接收方机会主义行为的影响与治理[J]. 管理评论, 2015(11): 170-180. 苏云霞, 孙明贵. 基于嵌入性的企业外部互补性资产合作研究[J]. 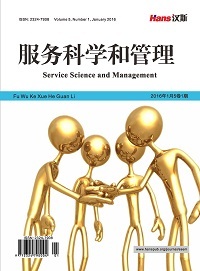 管理案例研究与评论, 2017(1): 20-33. 盛亚, 张文静. 资产性质, 权力-依赖关系对机会主义行为的影响[J]. 科技进步与对策, 2014, 31(23): 22-27. George, J. (1984) An Empirical Investigation of Some Antecedents of Opportunism in a Marketing Channel. Journal of Marketing Research, 21, 278-289. Pfeffer, J. and Salancik, G. (1978) The External Control of Organizations: A Resource Dependence Perspective. Harper and Row, New York. 钱丽萍, 任星耀. 渠道关系中专项投资不对等与机会主义行为间关系研究-正式化、参与与私人关系的调节作用[J]. 管理评论, 2012(10): 73-84. 刘婷, 刘益. 交易专项投资对伙伴机会主义行为影响的实证研究[J]. 管理科学, 2012, 25(1): 66-75. 薛佳奇, 刘益, 张磊楠. 竞争关系下制造商专项投资对分销商机会主义行为的影响[J]. 管理评论, 2011, 23(9): 76-85. Provan, K.G. and Skinner, S.J. (1989) Interorganizational Dependence and Control as Predictors of Opportunism in Dealer-Supplier Relations. Academy of Management Journal, 32, 202-212. 张钰, 刘益, 杨伟. 供应商影响战略与分销商机会主义-分销商关系承诺的调节作用研究[J]. 管理科学, 2013, 26(5): 50-62. Malhotra, D. and Gino, F. (2011) The Pursuit of Power Corrupts: How Investing in Outside Options Motivates Opportunism in Relationships. Administrative Science Quarterly, 56, 559-592. 孙鳌. 特许经营中的搭便车和机会主义[J]. 现代经济探讨, 2012(10): 14-18. Rindfleisch, A. and Heide, J.B. (1997) Transaction Cost Analysis: Past, Present, and Future Applications. Journal of Marketing, 61, 30-54. Bergen, M., Dutta, S. and Walker, O.C. (1992) Agency Relationships in Marketing: A Review of the Implications and Applications of Agency and Related Theories. Journal of Marketing, 56, 1-24. 郑石桥, 周天根, 王玮. 组织治理模式, 机会主义类型和审计主题-基于行为审计和信息审计视角[J]. 中南财经政法大学学报, 2015(2): 80-85. 王立磊, 张剑渝, 胥兴安. 感知供应商“关系取向”对分销商机会主义行为的影响-治理策略的调节作用[J]. 商业经济与管理, 2015(6): 25-37. Das, T.K. (2006) Strategic Alliance Temporalities and Partner Opportunism. British Journal of Management, 17, 1-21. Evanschitzky, H., Caemmerer, B. and Backhaus, C. (2016) The Franchise Dilemma: Entrepreneurial Characteristics, Relational Contracting, and Opportunism in Hybrid Governance. Journal of Small Business Management, 54, 279-298. 姜翰, 金占明. 认知环境不稳定性对合资企业成员机会主义认知影响的实证研究[J]. 管理学报, 2009, 6(1): 102-111. Stern, L.W. (1969) Distribution Channels: Behavioral Dimensions. Houghton-Mifflin, New York. John, G. and Reve, T. (1982) The Reliability and Validity of Key Informant Data from Dyadic Relationships in Marketing Channels. Journal of Marketing Research, 19, 517-524. Reve, T. and Stern, L.W. (1986) The Relationship between Inter-organizational Form, Transaction Climate, and Economic Performance in Vertical Interfirm Dyads. Heath, Lexing-ton. Crosno, J.L. and Dahlstrom, R. (2008) A Meta-Analytic Review of Opportunism in Exchange Relationships. Journal of the Academy of Marketing Science, 36, 191-201. 胡琴芳, 张广玲, 江诗松, 周南. 基于连带责任的供应商集群内机会主义行为治理研究——一种网络治理模式[J]. 南开管理评论, 2016, 19(1): 97-107. Dyer, J.H. and Singh, H. (1998) The Relational View: Cooperative Strategy and Sources of Interorganizational Competitive Advantage. Academy of Management Review, 23, 660-679. Achrol, R.S. and Gundlach, G.T. (1999) Legal and Social Safe-guards against Opportunism in Exchange. Journal of Retailing, 75, 107-124. 杨建华, 高卉杰, 殷焕武. 物流服务提供商联盟的关系治理和机会主义——基于正式控制视角[J]. 软科学, 2017(1): 124-129. 江旭. 联盟信任与伙伴机会主义的关系研究——来自我国医院间联盟的证据[J]. 管理评论, 2012(8): 51-57, 87. 曾伏娥, 陈莹. 分销商网络环境及其对机会主义行为的影响[J]. 南开管理评论, 2015, 18(1): 77-88. 李瑶, 张磊楠, 陶蕾. 如何利用社会关系来有效控制机会主义行为——基于外部环境不确定性的调节作用研究[J]. 商业经济与管理, 2015(6): 5-14. 周海军, 杨忠. 供应链企业间机会主义行为及关系契约治理研究——基于抵押物模型的实证分析[J]. 南京社会科学, 2014(1): 43-51. 张钰, 刘益, 李瑶. 营销渠道中控制机制的使用与机会主义行为[J]. 管理科学学报, 2015, 18(12): 79-92. Carson, S.J., Madhok, A. and Wu, T. (2006) Uncertainty, Opportunism, and Governance: The Effects of Volatility and Ambiguity on Formal and Relational Contracting. Academy of Management Journal, 49, 1058-1077. Lai, F., Tian, Y. and Huo, B. (2012) Relational Governance and Opportunism in Logistics Outsourcing Relationships: Empirical Evidence from China. International Journal of Pro-duction Research, 50, 2501-2514. 吴义爽. 关联博弈, 机会主义治理与中小企业融资的制度创新——基于“网络联保”信贷模式的案例研究[J]. 经济学家, 2009(5): 82-86. Argyres, N. and Liebeskind, J.P. (1999) Contractual Commitments, Bargaining Power, and Governance Inseparability: Incorporating History into Transaction Cost Theory. Academy of Management Review, 24, 49-63.